Please Note: This item will ship in September 2018. Subject to change. When the NASCAR XFINITY Series™ hits the high banks of DAYTONA® to kick off the 2018 season, Tyler Reddick will be driving the No. 9 BurgerFi Chevrolet Camaro. At DAYTONA International Speedway™ in February and Kentucky Speedway in July, Reddick will race the No. 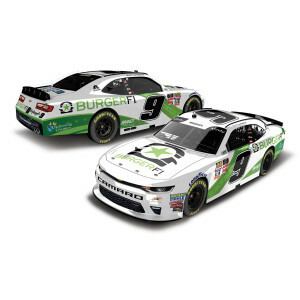 9 BurgerFi Chevrolet for JR Motorsports. Founded in 2011, BurgerFi is one of the nation’s fastest growing gourmet burger chains with nearly 100 locations across the United States and beyond. Fans won’t want to miss the official die-cast of Reddick’s No. 9 BurgerFi Chevrolet. Each 1:24-scale features an opening hood, poseable Goodyear tires, authentic deco, and comes in either an autographed or non-signed version. Plus, this die-cast is also available in 1:64 scale.